This morning Google held an event to showcase Android Honeycomb, the new version of the mobile OS that is focused on tablets. There wasn’t much news around the OS — we’ve seen it previewed in a few demos — but the team did show off some of Honeycomb’s slickest features, like widgets and an improved 3D rendering engine. But what about actually using the tablet OS? For all the whiz-bang previews we’ve seen, very few people have actually written about what it’s like to use these tablets. Unfortunately today’s event wasn’t the ideal place to do a full hands-on, either — there were dozens of reporters and only four tablets (most people got to play with one for maybe five minutes). But I wanted my fill of Honeycomb, so I stuck around til the crowd finally died down, put on my blinders, and took the Motorola Xoom for a 20+ minute spin. Apologies to the guy waiting behind me — I honestly didn’t realize you were there. Here are some of the features and apps that stood out — be sure to check out the video below for some of these in action. One of the most drastic changes is the move from dedicated hardware buttons to access Menu options to the ‘Action Bar’ — a UI element at the top of the screen with options that change depending on whatever application you’re using. If you’re in the tablet’s browser (which is based on Google Chrome) then this is where you’ll find your open tabs. If you’re in the movie editing app, it’s where you’ll find buttons to import a new clip — but if you hold your finger down on a section of a clip then the Action Bar will populate with options to add a transition or text overlay. 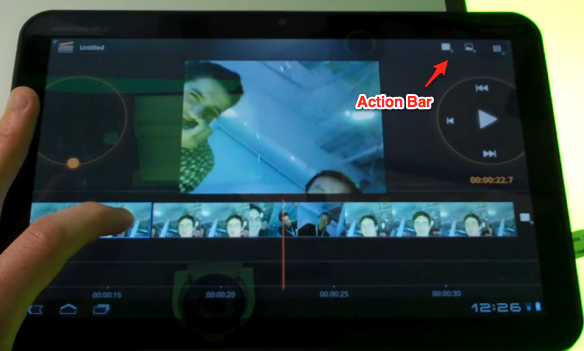 In other words, the Action Bar changes dynamically based on what you’re doing in an application. Most applications also include a Settings button in the far righthand side of the Action Bar, though this is only a convention and not a rule. In practice the system seems to work well, and you’ll find that you instinctively look toward the Action Bar whenever you want to find an application option or setting that isn’t part of the main UI. Of course, developers are in complete control over what appears in the Action Bar so there could be some consistency issues. But at least people will actually be able to find these options, which is more than can be said about the options hidden behind the ‘Menu’ button on current versions of Android (which many people never hit). We’ve seen it showcased a few times now, but Gmail for Honeycomb is awesome — it’s like the iPad-optimized web version of Gmail, but without the slight lag you still find on browser apps. I want it badly. I’ve never cared about copy & paste nearly as much as the people who spend their time complaining about its implementation on the web. But I know you’re out there, so here’s some good news: it’s works well on Honeycomb. If you’ve used Android Gingerbread you’re already familiar with the orange arrows that appear when you go to highlight text. These work pretty well, but there’s one problem: there’s no button to choose what you want to do with that text (the solution is to simply tap the highlighted text, which copies it to the clipboard, but some sort of menu overlay would be nice). Things are much better in Honeycomb: when you highlight text, the Action Bar changes from its current options to let you Cut, Copy, Paste, or Select All. Is it exciting? Not at all. But it’s a good example of how the Action Bar changes depending on what you’re doing, and I’m sure some of you are going to be over the moon about this. In general Honeycomb felt snappy — you can see in the video that there’s never really any lag. I did notice some slight jittering when dragging widgets, but was later shown a more recent build of the OS that seemed to fix this. And the fact that the Xoom has 1GB of RAM means that you aren’t going to find your browser tabs emptying the way they do on the current iPad. 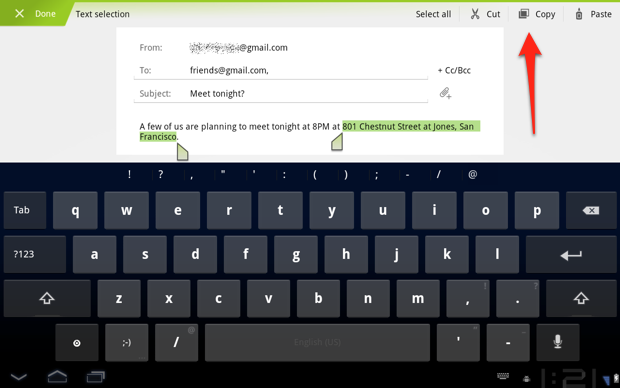 One of my biggest questions about Android tablets concerns usability. I believe that the iPad has been a hit in part because it is a simpler alternative to normal desktop operating systems, while still providing plenty of functionality for people who primarily surf the web, email, and watch videos. Many people buy iPads not just because they like the form factor, but because they want a computer that won’t prompt them with endless security alerts, software updates, and confusing installation processes. Android Honeycomb is decidedly more complex than the iPad. Instead of a single hardware button used to jump back to the home screen, as there is on iOS, Honeycomb uses a soft button in the bottom left hand corner of the screen. And maybe it’s just me, but the home button doesn’t even look that much like a home button (it could pass as an ‘up’ arrow, especially given the fact that the adjacent Back button is an arrow pointing left). And some of Honeycomb’s improvements over iOS could also be considered possible stumbling blocks. If you long-press the desktop, you’ll bring up the widget/wallpaper selector, which some people will undoubtedly activate accidentally (and promptly panic). The third button in the bottom left corner lets you jump between recently used applications — a feature that I’ll love, but could confuse people who aren’t sure what’s going on. But overall the OS is pretty easy to get the hang of. I’d still feel more comfortable handing an iPad to my mother (who absolutely loves hers, for what it’s worth), but the learning curve with Honeycomb isn’t very steep. If you’re comfortable doing more on your computer than email and browsing the web — and have ever felt a little restrained using an iPad — then Honeycomb may feel like a breath of fresh air. Your home screen is no longer simply a grid of your favorite applications — it’s a dashboard populated with content, like your recent emails, favorite chat buddies, weather, to-do list, and more. Widgets aren’t anything new for Android, but they’ve always been cumbersome on mobile devices because screen real estate is so limited (I’ve found myself debating between keeping my Calendar widget or giving myself an extra row of apps on my phone’s home screen). On Honeycomb this is much less of an issue. Widgets are the sort of thing that prove their worth over time (as opposed to during a 20 minute demo), but my initial hunch is that people will love them. This is a big advantage for Android now, but I’ll be surprised if the next version of iOS doesn’t include widgets and notifications. Then again, I was surprised that the last version didn’t include them, so who knows. 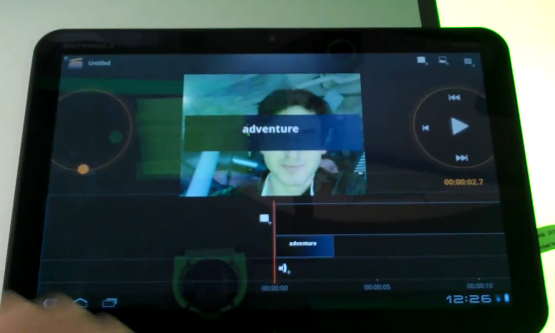 The first Honeycomb tablet is the Motorola Xoom, which will probably ship in the next month (the release date hasn’t been announced yet). From a hardware perspective the tablet feels fine. It’s not great — it feels a little too heavy for its size, and I wish the screen resolution were higher — but it’s good enough for people itching to get their hands on an Android tablet. And if you don’t like the Xoom there will be plenty of other choices in the coming months. 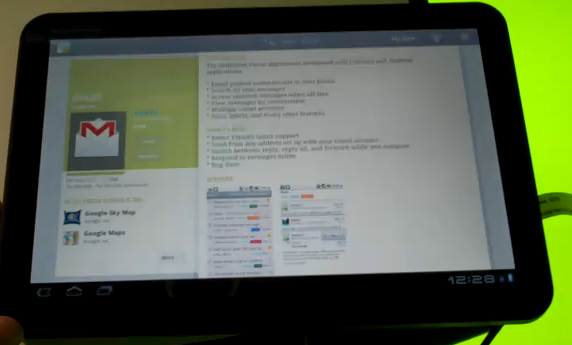 Judging Honeycomb based on the Xoom would be like judging Android based on the G1 (okay, okay — maybe the HTC Hero). During the last Apple earnings call, Apple COO Tim Cook dismissed existing Android tablets as “bizarre“. And rightly so — they took an OS that was designed with mobile phones in mind, scaled them up to larger screens, and told consumers they were good to go. The Galaxy Tab was supposedly selling anyway, until it was revealed that previously released figures were misleading and that actual sales were quite small. Which shouldn’t surprise anyone who actually used one. Update: Apparently the Samsung exec who said sales were “quite small” was misquoted — he said “quite smooth“. I still don’t think it’s nearly as good as the iPad. But Honeycomb changes all that. It’s a solid competitor to iOS — better, even, in some ways. 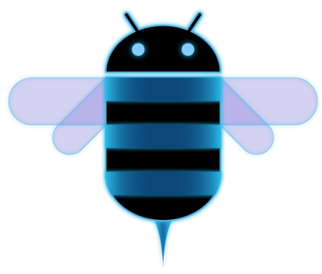 I won’t be at all surprised if we see Honeycomb explode on tablets the way Android has exploded on mobile handsets since the original Droid launched in November 2009. Yes, carriers and OEMs will undoubtedly add their own skins and bundled applications, but provided they don’t do anything too outrageous to the user experience, Honeycomb feels like a winner. Google Unveils Android Market Webstore. It’s Already Live!